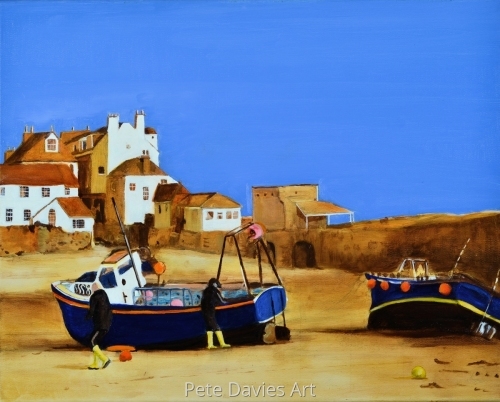 I saw two boats and two fisherman counting their catch on the beach at St Ives, Cornwall. A timeless scene, reminiscent of pirates and smugglers, dragging their haul through a black moonless night to the a crackling log fire, where me n huddle and talk in whispered tones in case a stranger comes in. I drew a sketch and quickly left. 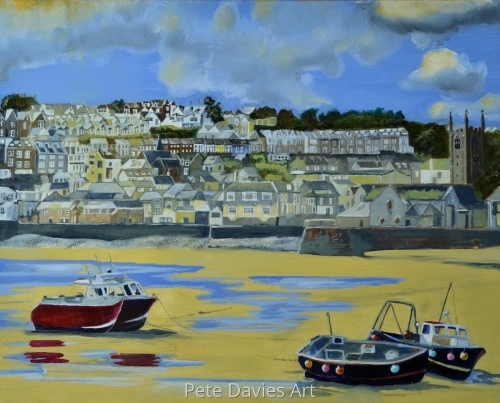 14" x 17.5"17" x 21"20.75" x 25.75"
This is a picture of St Ives in Cornwall. I was particularly pleased with the way the breakwater and church turned out. The pools of water were an afterthought so that I could add the reflections. 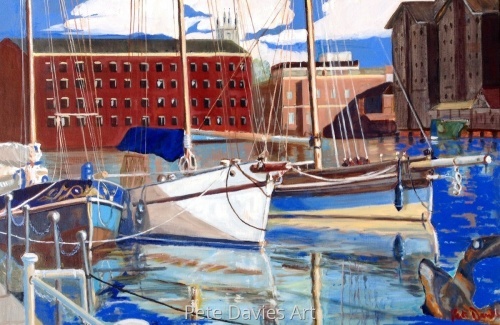 11" x 13.75"17" x 21"19.25" x 23.75"
Two boats painted in the Autumn sun at Gloucester Docks, England. 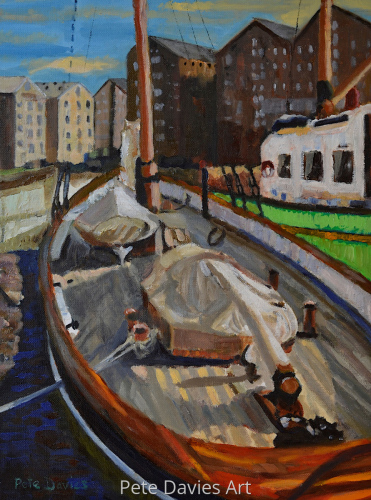 I really liked this painting, the deck of the boat on the right took a lot of work with layer upon layer of transparent paint before I achieved the desired effect. 12.25" x 8"13.75" x 9"15.25" x 10"
A view of Gloucester Docks, England, Autumn 2015. I really enjoyed painting the reflections and colours in the water. I was also pleased at the light falling on the small building on the right in the background, it reminds me of the council offices in Lewes where I was born. 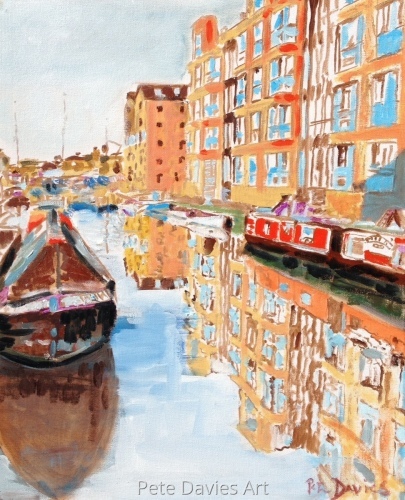 9" x 13.75"10" x 15.5"
The Barge Arm, Gloucester Docks. This is an oil painting on board. 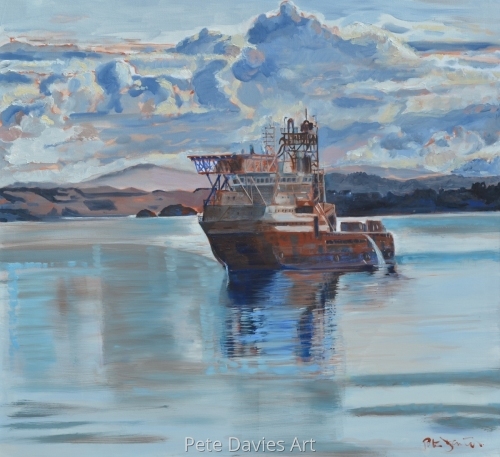 I enjoyed painting this picture because on that particular summer day, the water was glassy and the reflection so clear. 9.75" x 8"11" x 9"13.75" x 11"
This is a painting of the Island Frontier, an offshore oil well intervention vessel, sailing into Norway at 5:00 am in the morning. The painting uses a limited palette of predominately brown and blue. I wanted to show how the sunlight starts to introduce colour on the land as the town wakes up and night turns to day. The boat was painted first in blue then in red, I settled on a mixture of the two. I had a thought that I might paint a horizontal bright green line where the land meets the sea, but I never did. 14" x 15.25"17" x 18.5"20.5" x 22.5"
This is the second painting I completed in an impressionist style. The other painting is Le Café des Tribunaux, also on this website. The green boat never was green but was a kind of dirty white but I changed it to compliment the maroon colour of the larger boat. 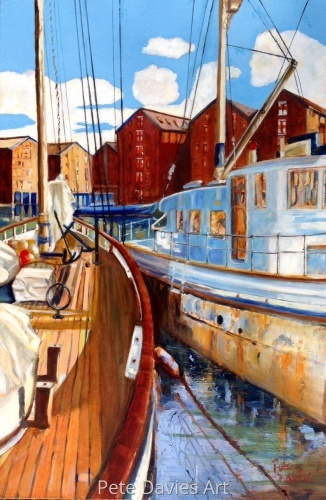 I was particularly happy with the shadows on the left hand side of the painting, in the gap between the dock wall and the side of the boat. 14.75" x 11"17.5" x 13"23.5" x 17.5"